STUDENTS from Onelife Taekwon-Do Academy have shown they are among the best in the world. 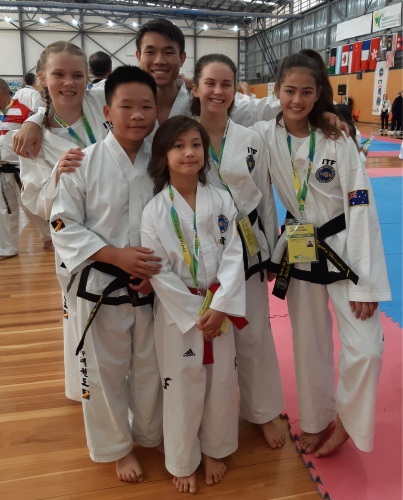 The academy, which trains in Karrinyup, had seven students compete at the Chan Hun International Taekwon-Do Federation (CHITF) World Championships in Melbourne in March. Kyela Horobin (12) and Reagan Horobin (10) won gold medals in their divisions, with Reagan also winning bronze in the patterns coloured belt division for boys aged 10 to 13. Lotte Stuart (14), Enna Stuart (12) and Jeremy Koh (21) returned home with silver medals and Tim Telcik received silver and bronze for patters and sparring respectively in the first to eight dan black belt competitions for men aged 46 to 55. Raiden Trans (11) competed well in sparring and patterns but just missed out on a medal.